If you are to make the change over to natural organic products for any skin care product then I recommend that it be your eye cream! The skin surrounding the eye is thinner and more delicate than any other skin on your face or body and will usually be the first place to show the signs of aging, such as fine lines and bags. This is why women will spend hundreds of dollars on top eye creams under the mistaken belief they are doing the right thing for their skin. Unfortunately, the chemicals found in most eye creams, such as parabens, petrochemicals and synthetic colours and fragrances, act as irritants to this sensitive skin, working against the cream and actually accelerating the aging process. Mukti have created a natural gel based formula infused with rosehip which makes a great option for those wishing to keep those fine lines at bay. Rosehip is a powerful antioxidant which is why it is seen more and more in natural skin care. 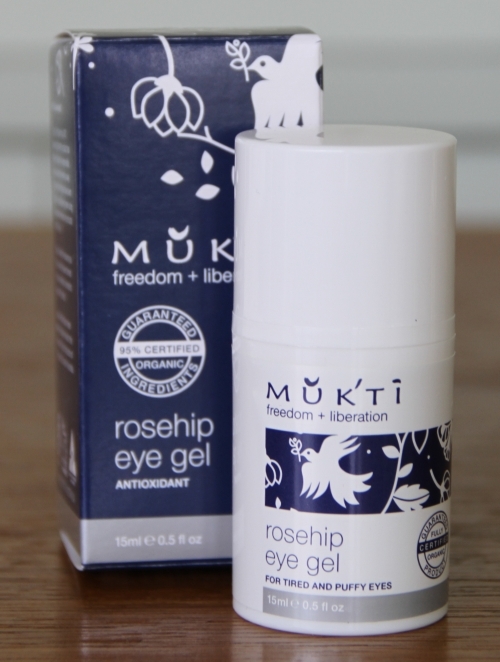 The Mukti Rosehip Eye Gel goes on smoothly and does not leave behind any sticky residue. Other eye gels I have used in the past would sometimes go a bit clumpy when they dried and if I accidently rubbed my eye area later it would peel off. This product thankfully does not do that. Please note that the gel does not have a clear gel appearance, it is white and is more like a cream. I think this gives a better consistency too. You will only need to press the pump down halfway as a full press dispenses too much. I made this mistake a couple of times and you can see in the photo below that it is a little too much. Press the product gently around the contour of the eyes. Do not rub or drag the skin. You can use this product day and night. I found the eye gel to be really refreshing when applied and after about a week I began to see a smoother appearance to the area. This product is also great value and a good addition to your skin care regime. 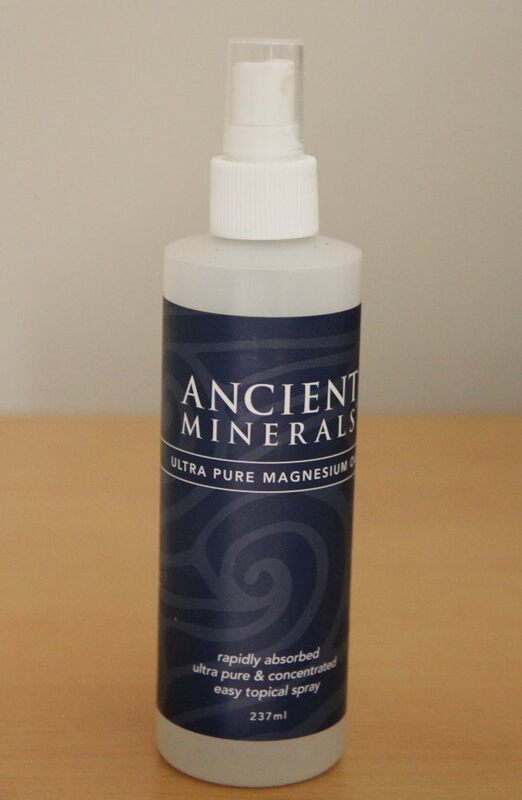 This product can be purchased for $38.95 online at www.muktibotanicals.com.au. Certified Organic Aloe Vera (Aloe Barbadensis) Leaf Juice; Certified Organic Rosehip Oil (Rosa Canina); Certified Organic Calendula (Calendula Officinalis) Extract; Glycerin (Vegetarian); Vitamin E (Tocopherol); Scleroltium Gum; Certified Organic Shea Butter (Butyrospermum Parkii); Certified Organic Macadamia (Macadamia Ternifolia) Oil; Certified Organic Coconut (Cocos Nucifera) Oil; Cetearyl Glucoside (Vegetarian); Certified Organic Roman Chamomile Oil (Anthemis Nobilis); Grapefruit Seed (Citrus Grandis) Extract. This product was given for review consideration by Mukti. All product reviews and honest opinions on this site are solely that of my own and I am not endorsed or paid for this review. 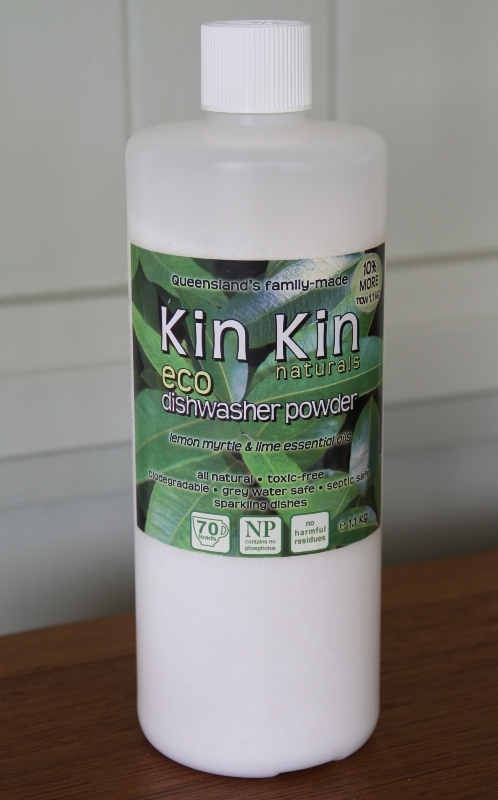 Felix from Kin Kin Naturals kindly sent me their Eco Dishwash Powder to try and I am pleased to say it lived up to the high quality and standards that I have come to appreciate from their company. Most other brands still contain a high proportion of the toxic ingredient alcohol ethoxylate in their products but thankfully Kin Kin Naturals does not. When I looked back at the ingredient list of the EcoStore dishwasher powder that I had previously reviewed I noticed that it did in fact contain that ingredient. I will definitely stick to the Kin Kin Naturals version now. Kin Kin Naturals Dishwash Powder is straight forward to use just like any other powder. 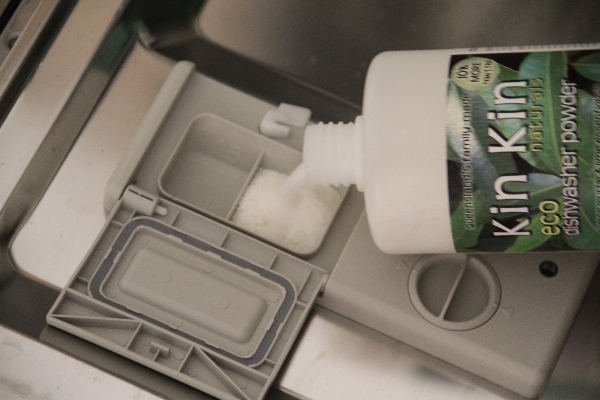 Simply pour into the dispenser compartment of your dishwasher! The dishes and glassware came out clean and had no trace of residue or streaking. And when looking at their ingredient list I really liked how they explained which ingredients did what and I could see that they had specific ingredients for glass protection and spotting etc. You can purchase the range of Kin Kin Naturals products online at stores or various retail stores around Australia. Visit the Kin Kin Naturals website www.kinkinnaturals.com.au to find a store near you. The R.R.P is $12.95 which is great value. Coconut & sugar based nonionic surfactant (no alcohol ethoxylate, LAS or SLS), sodium bicarbonate (baking soda), sodium citrate (citrus based water softener), sodium percarbonate (oxygen releasing soda), sodium carbonate (washing soda), sodium silicate (glass protection mineral), sodium gluconate (glucose derived anti spotting agent), enzymes, organic lemon myrtle essential oil, lime essential oil. Making the change to natural and organics cosmetics can be one of the harder steps to take, and in my opinion this is due to the fewer options available in the organic range and also due to the huge marketing budget and therefore the large presence that the mainstream brands have in our lives. Luckily Australia has a number of great companies such as Zuii that are making wonderful cosmetics. Zuii Organics kindly sent me a range of their natural organic makeup products to try and review. Today’s review is on their Certified Organic Flora Mascara and I will be reviewing more of their products in upcoming posts. A good mascara is definitely a must have and making sure it does not contain toxins and petrochemicals is imperative. Not only does Zuii’s mascara meet this criteria but its unique formula also conditions your lashes. I found this mascara easy to apply and even though it adds length and thickness to the lashes, it does not clump and it keeps the lashes separated, giving a nice natural look. I would definitely recommend this mascara as a daily wear mascara especially because it is paraben free and keeps your lashes in good condition. To make your lashes thicker, let it dry for a few minutes and then apply another coat. The mascara is not waterproof so be careful of smudging. This is a review of the Granite colour but this organic mascara is also available in Lapis (a blue colour) and emerald (black). Zuii Organics is Australian owned and made and is powered by compassion and enthusiasm when it comes to developing their organic and natural cosmetics. Their mission has led to ecological sourcing of Australian grown certified organic ingredients; one-of-a-kind manufacturing processes and international standards, and a commitment to a “cruelty free” policy; absolutely NO animals are tested in any part of their cosmetic production processes. 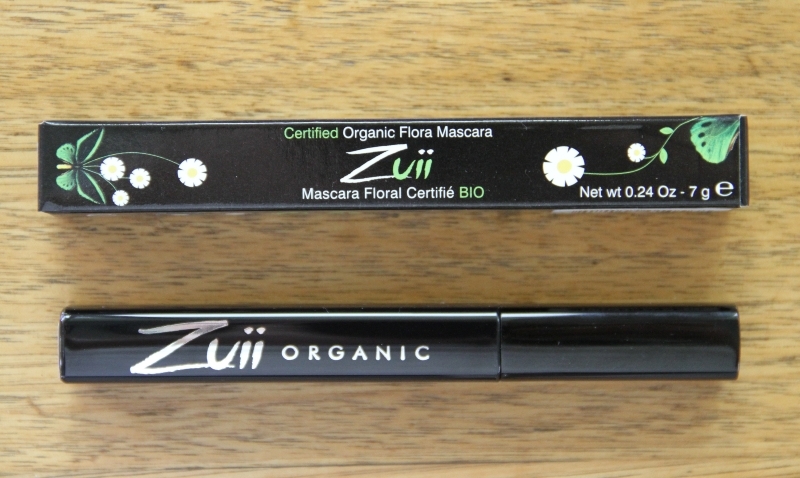 The R.R.P for this mascara is $27.95 and is available to purchase from their online store www.zuiiorganic.com. This product was given for review consideration by Zuii. All product reviews and honest opinions on this site are solely that of my own and I am not endorsed or paid for this review. Unless you are under the age of 20 and don’t have any problems whatsoever with your skin then you could really benefit from Botani’s Olive Skin Serum! In fact – no, everyone could benefit from this great product, men included. When I see any olive derived product I have in the past envisioned a greeny brown oil with a strong smell which I would be hesitant to wear on a daily basis. But this olive skin serum is actually nothing like that. Although it is 100% plant derived from olives, it is actually formulated with pure squalene from olives. The result is a clear serum that is almost odourless. The active ingredient of olive squalene actually replicates your skin’s natural moisturising and protective properties which is what makes it so effective. It also helps deliver oxygen right into the cells which is important for cell rejuvenation. The serum is best applied to moist skin and only a couple of drops are required. The bottle somes with a dropper so you can easily control how much you use. Because you only need to use a little it should last a long time. The first time I used this product I immediately noticed the instant hydration effect it has. My skin was left with a soft velvety feel and after a few days it became noticeably more supple. The thing I like most about this olive skin serum is that it is light on the skin and I feel that it penetrates the skin quickly, especially when used when the skin is moist. I also love that I can use it around the eye area as this area is the one that for me is starting to show more signs of ageing and dryness. And of course I love that it is 100% natural and has no added frangrances etc but it still has a pleasant smell. This product is recommended for those with dehydration, sensitive skin and flaky skin, sun damage, rosacea, dermatitis, psoriasis, eczema, skin prone to scarring, lightening freckles and pigmentation, devitalised, lifeless skin. 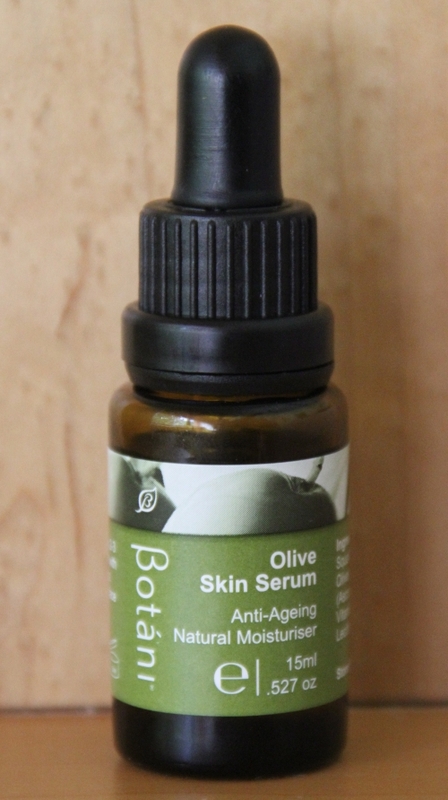 The R.R.P of the Botani Olive Skin Serum is $31.95 and can be purcahsed from their online store www.botani.com.au where you can also find more information on this product and their whole range of natural skin care products. This product was given for review consideration by Botani. All product reviews and honest opinions on this site are solely that of my own and I am not endorsed or paid for this review.